We went to one of R's other projects yesterday because he had set out paver samples for those clients (whose house is much further along than ours is) to make a choice. We didn't include a driveway in the contract but want to add a paver driveway, plus a paver walkway leading to the front door (there was some thought of reusing the old driveway, which we left in place to reduce the mud tracked into the road and so there would be somewhere for materials to be dropped off, but it's old and has already gotten beaten up by construction equipment...and it turns out pavers don't cost much more than concrete). R had a good selection of paver sizes, shapes, and colors laid out, so we're confident that we'll be able to find just the thing (although we probably have at least four months before we need to commit). We are plagiarizing a lot of the selections from this house. 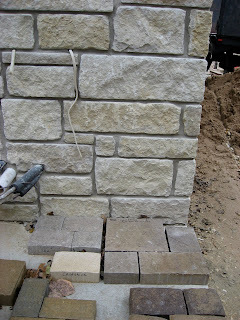 Since their stone (Buff Leuders) is one of the prime contenders for our stone (or something very similar), we took this picture to show what it looks like with some of the paver options. We actually went back to the other house today because we forgot to look at the exterior window color, which we're probably also going to copy. (We are using the same windows -- Marvin Integrity double-hung, with wood interiors and Marvin's vinyl-like synthetic exteriors -- and are leaning toward the tan ("cashmere") exteriors.) Although these windows don't take as long to order as most, this is one of our next selections we'll have to commit to. While we were there yesterday, R explained why we failed Friday's inspections. The building layout failed because the steps leading down from the side door to the garage were just a tiny bit too big (they went about two inches too far into the side setback), but this will be easy to reduce before pouring the foundation and will actually work better for us. We failed the plumbing inspection (which they call the "copper inspection," although they now use flexible PEX piping instead of copper) because the inspector didn't like the distance between the water heater and the farthest plumbing fixture. 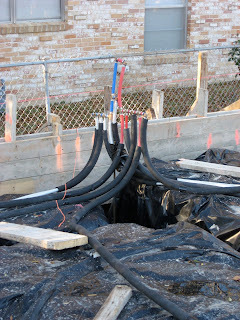 While this is apparently fine as long as there is a pump to help the water travel that far, we had already addressed that issue by including a recirculating line, which will include a pump once the construction gets to that point. So basically it was the inspector's mistake in not recognizing the recirculating line and deducing that there would of course be a pump. (The recirculating pump is a great green feature. It is controlled by a button at each plumbing fixture. When you push the button, the pump sends the water in the hot water line back to the water heater, refilling the line with hot water so we won't waste water waiting for the water to warm up.) This picture shows the plumbing to the water heater. There are so many pipes because of the recirculating pump, which accounts for two of the red pipes (one coming, one going). Looking at the plumbing and trying to figure out which appliance is going where is like trying to solve a puzzle. I guess I can see why the inspector got confused. Anyway, hopefully we'll pass both inspections tomorrow and be on to rebar.